Over the next month, Eastgate Theatre audiences will have the chance to experience performances that showcase the next generation of artistic talent emerging from this extraordinarily creative part of the Borders. This is an article about the fun and benefits of volunteering at the Eastgate Theatre. All or Nothing Aerial Dance Theatre and Room 2 Manoeuvre, two Edinburgh based dance companies, have teamed up to present a light-hearted new touring show for all the family, featuring a stunning fusion of breathtaking aerial acrobatics, dance theatre, contemporary circus and visceral choreography. Sixty years ago, on 3rd February 1959, Rock ’n’ Roll lost its brightest star – Buddy Holly. 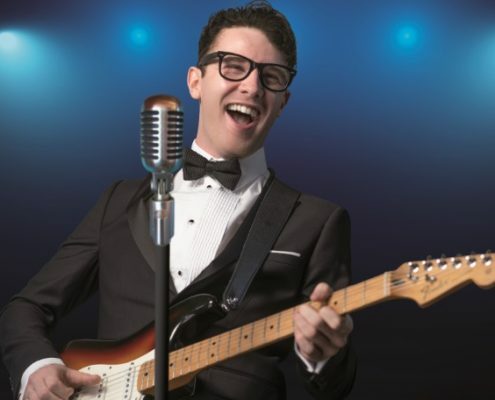 To commemorate Buddy’s anniversary and to celebrate the joy he has brought millions of people worldwide Buddy Holly and The Cricketers are presenting a very special show in venues all over the UK. On Friday 8 February the band will aim to raise the roof of the Eastgate Theatre, Peebles. This season the Eastgate has extended its reach with a range of professional productions staged during the day and events at venues across Tweeddale as well as the packed weekend of the Peebles Outdoor Film Festival and the programme of blockbuster films every second Sunday. Invite to see artist impressions of the planned auditorium development and discuss options with the Project Design Group. As we prepare to welcome in the New Year, the Eastgate Theatre in Peebles looks back on an eventful and busy 2018 that also saw significant progress in the development plan that will transform the auditorium and make the theatre better able to serve the community for decades to come. On Friday 19 October the Eastgate Theatre in Peebles presents the World Premiere of STUFF a play by an award-winning creative team that explores the hoarding of memories, emotions and things. STUFF is the new play by Sylvia Dow, directed by Muriel Romanes and designed by renowned artist John Byrne. The idea came from a simple poster with the word mess on it. It led Sylvia to think about the difference between most people who have a lot of stuff in storage and some people with a hoarding disorder where everything has equal value and so everything must be kept. Muriel was intrigued by the idea and the concept took physical shape when John Byrne came up with a series of boxes each holding its own art installation. The Eastgate Theatre welcomes a comedy first on 4 October when Glaswegian stand up Ray Bradshaw performs Deaf Comedy Fam – the world’s first comedy show performed simultaneously in British Sign Language and English.